The Dada East, initiated by stylist Edoardo Seghi, have more than one trick in their make-up kit. 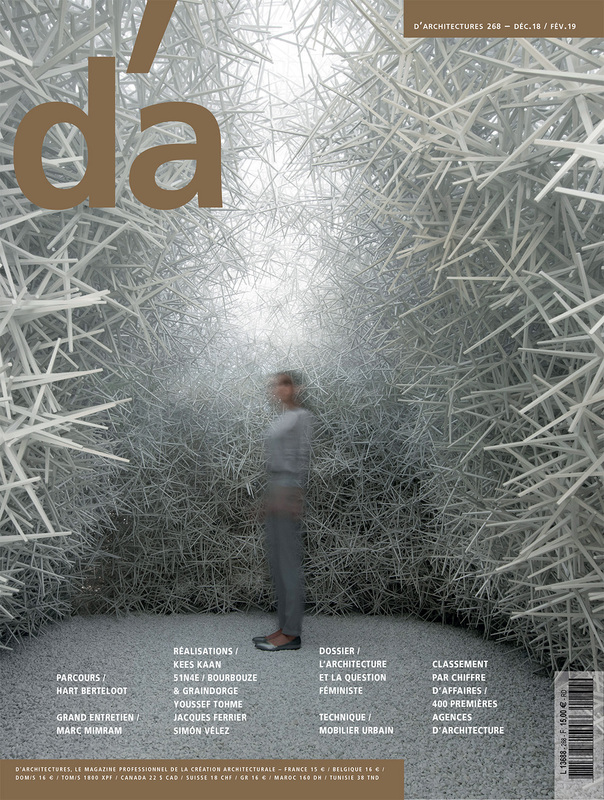 The beauty salon, named in tribute to the art movement of the twentieth century, the Dadaists, hosts, in addition to its customers in search of a new face, art exhibitions and vernissages. An original concept that had to evolve in a single envelope. In response to the philosophy of the house, the show had already appealed to Joshua Florquin for the development of a first show in Trousseau in the 11ème arrondissement of Paris. 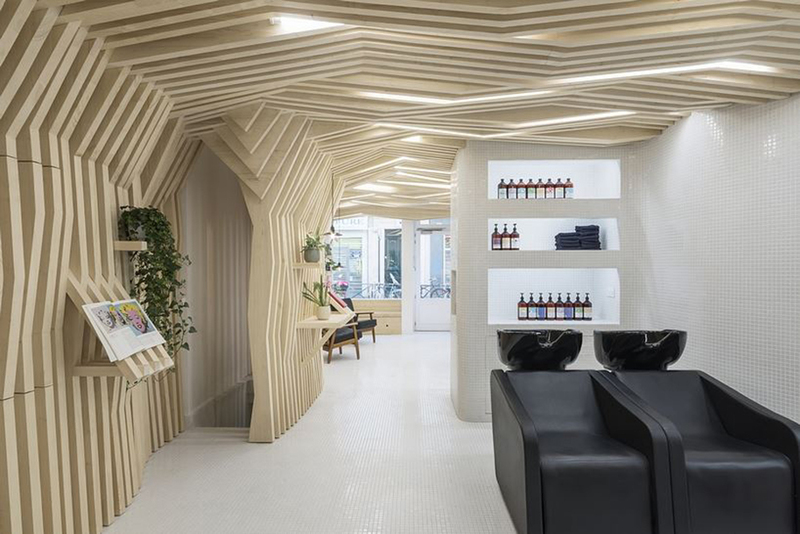 It is therefore natural that the architect responded to the call of the design of a second shop, located in the Paris district of Bastille. 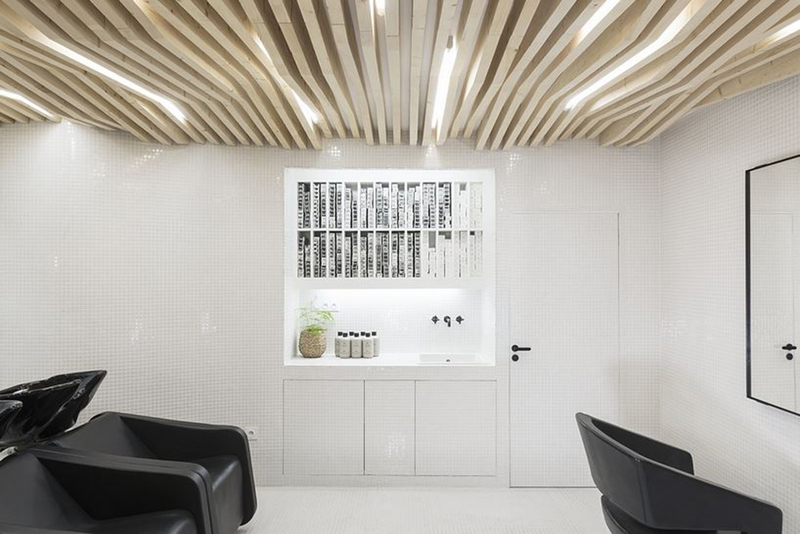 He imagines on the occasion 2.0 forest environment, evolving between the slats of raw wood and the tropical plants, and the natural light filtered by the made-to-measure ceiling. 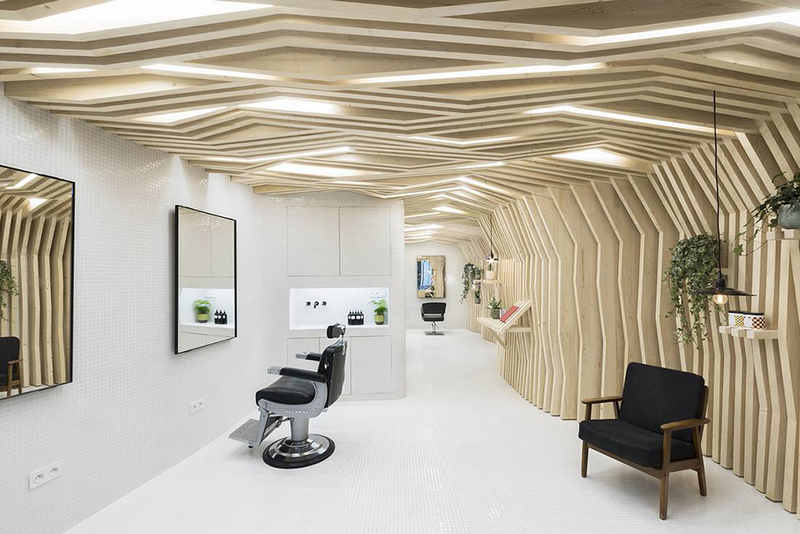 The 50 square meters of the lanky shop are distributed according to a row plan: the entrance serves the reception which itself serves the waiting room to the east and the barbers to the west, both separated from the rooms. spaces dedicated to cutting and coloring by a return. 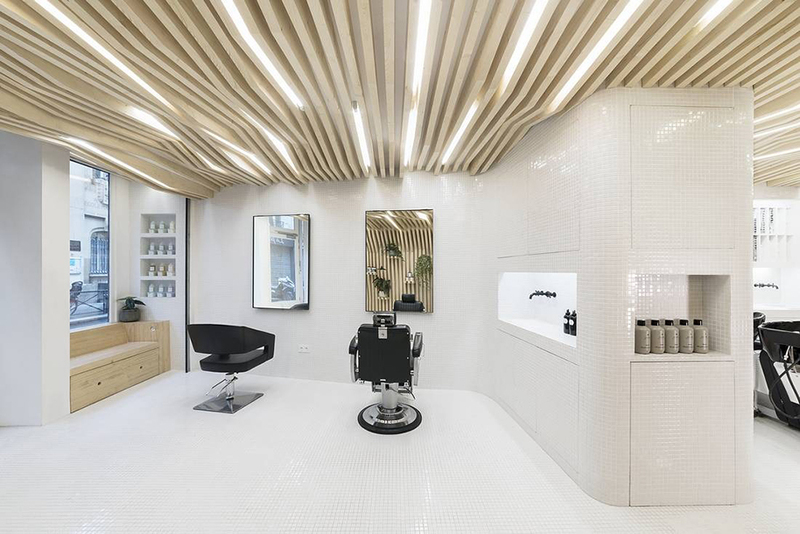 The two side walls of the salon contrast two different treatments: the eastern part is characterized by white ceramic tile coverings framing the areas of hair with ease when, on the other side, the wall of 238 carved pine slats seize the eastern part and the ceiling to take the shape of a forest of branches, in which come down the recessed lights. 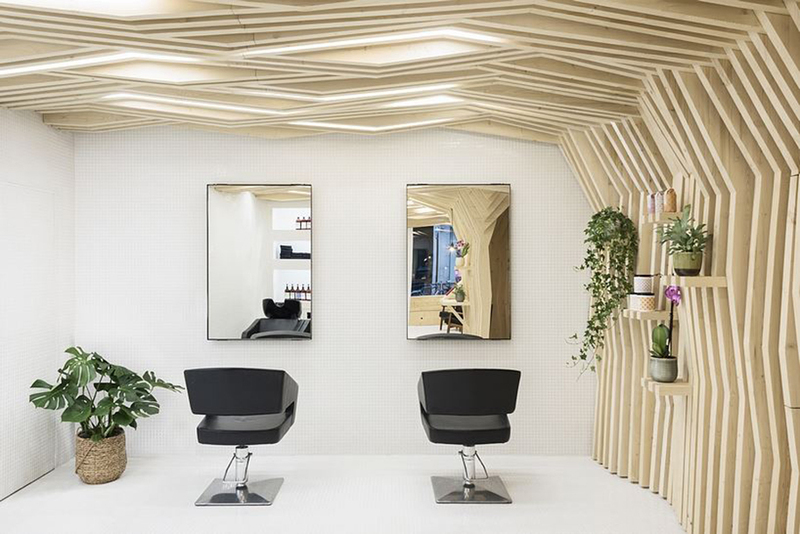 The displays of the products that the salon sells are discrete, incorporated into the imposing wooden sculpture. The minimalist mirrors, which face this structure, further deepen the image of an urban jungle that would have taken root inside the building. Designers choose to add a selection of plants reminiscent of undergrowth, such as Hedera, or climbing ferns, as well as tropical epiphytic plants such as orchids.